When Stanley Bonds composed a love song for his wife, it is unlikely he expected it to be recreated digitally for her funeral 74 years later. But Steve Castle, 43, did exactly that after finding the manuscript in his 96-year-old grandmother Violet Bonds' possessions after her death. Steve said the waltz was composed near Rome in 1945, where his grandfather was stationed during the war. But the family had no idea it existed until after Mrs Bonds died in February. "Musically, it's of its time," Steve said. "You can tell it's from 1945, it's got that feel about it." While Steve, who lives in Penarth, does not have any real memories of his grandfather beyond stories he has been told and photographs he has been shown, he said his love of music was one thing he knew for sure. "Grandad played piano in bars and in a dance band, it was that kind of 1950s cabaret sort of vibe. I think that's what he was into," he added. Steve said his grandmother, who was originally from London but moved to Cardiff with the rest of the family in 1982 shortly after her husband died, had been widowed almost as long as she was married. "Music was an important part of both their lives," Steve said. "Nan had a piano from a young age but Grandad was the one who played it the most." After moving to Cardiff, Mrs Bonds worked in Cranes music shop - based in St David's centre at the time. She also worked in a piano shop and learned to play the organ - something she persuaded her grandchildren to take up. Steve said he became a sound engineer due to the early love of music bestowed onto him by his grandmother, "which is one of the mysteries surrounding this manuscript". "We don't know why she didn't show it to us when we were learning and why none of us knew anything about it," he added. 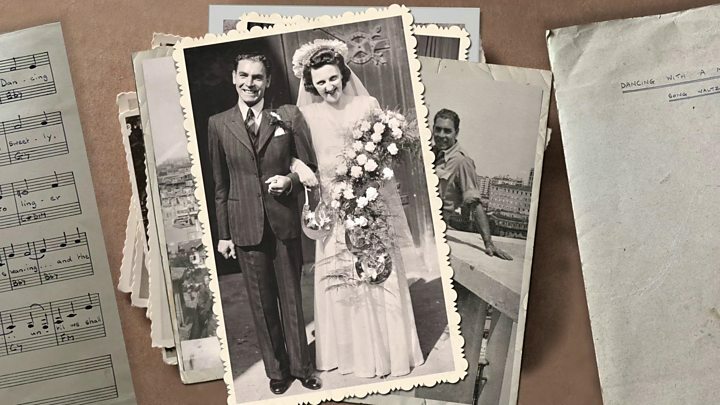 Mrs Bonds kept a drawer full of old anniversary and birthday cards sent to her by her late husband and when Steve and his mother became executors of her will, the manuscript for Dancing with a Memory was found. Steve said: "I'm filled with quite a strong sense of regret. "In her latter years Nan suffered from dementia, which was pretty bad in the final year or two. It was never bad enough for her to have difficulty recalling names and memories of family, just short term facts. "I keep thinking how amazing would it have been to have found this piece and been able to play it to her as a reminder of her husband." Steve did not feel able to play piano or read music well enough to play the piece, but used his knowledge from playing as a child and his experience working as a sound engineer in Cardiff to programme it - so it could be heard for the first time in decades at Mrs Bonds' funeral on 19 March at St Peter's Church, Fairwater. "I played it as a way to get out of having to write any more of the eulogy, which was hard enough as it was." At first, it sounded "a bit robotic", Steve said, but after working on the piece some more he felt he had done his grandfather's creation justice. "Programming the music into the computer meant that the piece slowly unfolded bit by bit in a really exciting way and I'm really grateful of that experience." Steve also posted the song online - and said it went "a bit bonkers" after he saw it had been played more than 900 times in the first 24 hours, and a classical music radio station contacted him interested in re-recording the piece. While his grandfather wrote the music, Steve said he did not write the lyrics - and while he has tried to track down the person who did, he has not been successful so far. "We presume someone he was stationed with collaborated with him - he just wrote the music. They do however tell the story of being separated from a loved one - which Nan and Grandad were during the period of the conflict. "Stan was the only one of my grandparents that I didn't really get to know, all my other grandparents died when I was in adulthood, so it's an amazing gift to have found this piece of music from my Nan as a connection to him. "And using the language of music was a perfect way to make that connection." Should grandparents come on holiday with you? What makes your grandparents great?